CHB Eco Custom Home Builders Structured Cabling System is the foundation on which your home communications and entertainment network built. It designed to organize and distribute connectivity technologies throughout your new home. Structured cabling connects each room on a “direct run” of high-capacity Category 5e/6 and coaxial cable RG-6 Home-Run and 2-RG11 from outside to a central enclosure called a Structured Media™ Center (distribution panel). This centrally located system then manages and distributes voice, data, audio and video signals throughout your home. CHB Eco Custom Homes ESC (Electronic Systems Contractor). 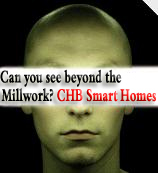 CHB Home Automation to Home Theaters, Energy Efficient Homes to Smart Home Technology. Home base solution connects your home through RG-6 quad-shield coaxial cable for TV and video applications and CAT5e wiring (the same wiring used in computer networks) for phone, data, and other applications. Quad-shielded means you have maximum protection from interference with your TV picture. CAT5e wire can offer up to four dedicated phone lines without crosstalk and supports very high-speed networking. These cables deliver all the performance you need today, while providing the capacity to handle tomorrow's technology. home - similar to the electrical breaker panel. The service center is also the site for mounting electronic equipment and other system modules used to offer more advanced applications and home solutions. Capital Home Builders home base solution provides the required foundation for your home's electronic infrastructure. This up-to-date home wiring system is necessary to take advantage of applications today such as digital TV, multiple phone lines, home Internet access, and prepares your home for rapidly emerging technologies. The base solution typically provides distribution of telephone and TV services to a specified number of wired outlets in multiple rooms. To meet your lifestyle needs in entertainment, communications, and comfort, Capital Home Builders provides a suite of home solutions that add value to your investment and enhance your home living experience. All of our smart technology features or done in-house. Our installers have more than 15 years of experience in home automation and home wiring. By offering this smart features in-house Capital Home Builders is able to keep the cost of the system and installation to a minimum.